KTM, Husaberg, WP fork springs are very high quality with spring rates not available from WP or other manufacturers. Rated in Newton Meters (N/mm) per millimeter and Kg/mm. KTM, Husaberg, WP fork springs made in the USA and Europe for Slavens Racing. The WP4860 43mm O.D. 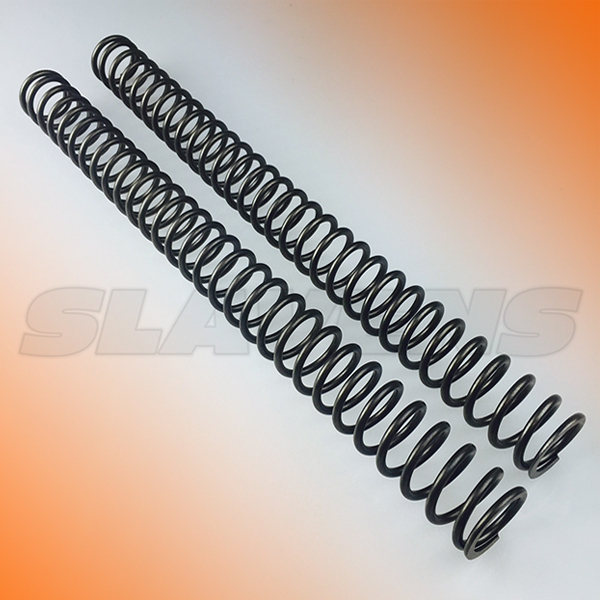 x 505mm length fork springs for KTM & Husaberg are very high quality with spring rates not available from WP or other manufacturers. Rated in kilograms per millimeter (kg/mm) and Newton Meters (N/mm) per millimeter. Most competitors springs are manufactured in Asia. The wire quality and fitment is poor, testing softer than stated (i.e. : a .46-kg/mm springs tested @ .45-kg/mm). Note: European manufactured springs are rated in Newton Meters (N/mm). USA made springs are in Kg/mm.